After the success of last year’s IWSG Guide to Publishing and Beyond, we decided to create another book. 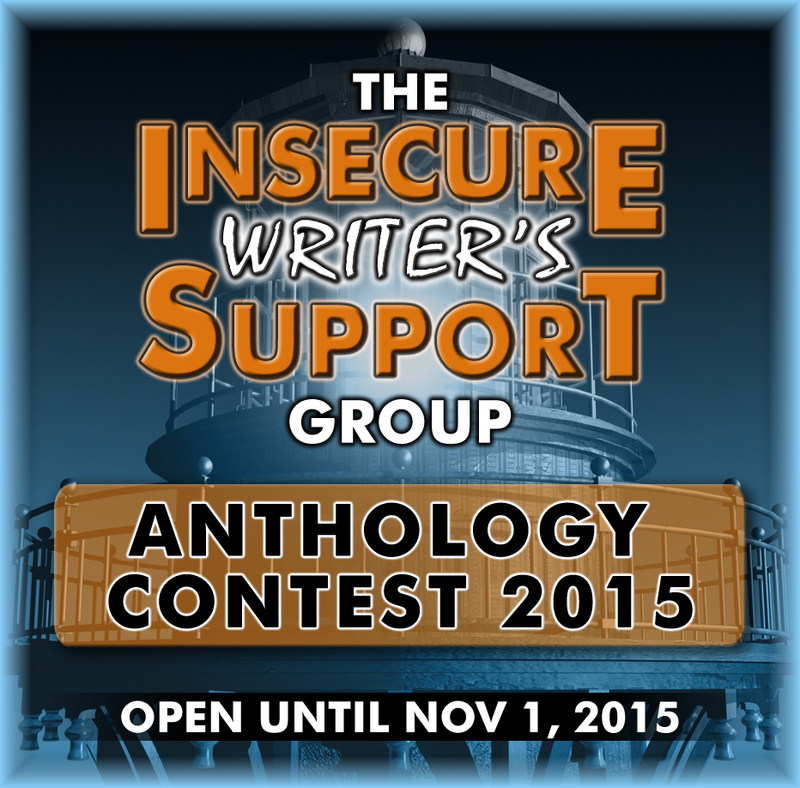 This time it’s a short story competition with the top ten stories getting published in the anthology. Theme: Alternate History/Parallel Universe. That’s right, we’ve decided to go the speculative route. This theme has plenty of scope and we’re open to pretty much anything along these lines, except erotica or graphic violence. How to enter: Send your polished, formatted, previously unpublished story to TheIWSG at gmail dot com before the deadline passes. Make sure to include your contact details. 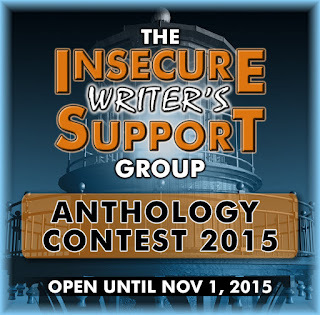 Prizes: The winning stories will be edited and published by Freedom Fox Press next year in the IWSG anthology. Authors will receive royalties on books sold, both print and eBook. The top story will have the honor of giving the anthology its title. The winners will also receive an exclusive badge to display on their blog. Today I am one of the co-hosts for the IWSG. Yay! My fellow co-hosts are Heather M. Gardner, Christine Rains, Dolorah at Book Lover and Julie Flanders. I don't like trying new things. Mostly, because I'm afraid of screwing it up, and having everyone laugh at me. Also, I'm afraid of failure. There are many things I have failed at in my life, and honestly, I just don't want writing to be one of them. As you know, I will be publishing my first book soon, and I am terrified. I am all nerves. I do admit, it has gotten better, because I have been exercising, and so many of you have advised me to just chill. However, I have this obsession of doing things perfectly, even though I know there is no such thing as perfection, at least not for humans. But, what if there are spelling errors neither me, or my editor picked up (my editor is awesome by the way)? What if people hate my book? What if . . . What if. The truth is, I'm just really nervous. But this kind of anxiety and fear is also good for me. I have to learn to control it if I want to make "writing" my career. I have to experience this insecurity to learn and grow from it. It isn't a nice feeling, but I have to live and learn. If any of you think you can't write a book, or that you can't make your writing dreams come true, you can. If I can write a book and get it publish ready, so can anyone. All you have to do is believe in yourself and be determined to follow through. Thank you so much for co-hosting. You know I can so relate to what you wrote about yourself. I still battle with the perfection complex. I know that nothing and no one is perfect, but still I have this desire to do everything right. It took me years to realize that it is okay to have that desire so long as you don't internalize it and try to be it. Just accept that you are one of those fallible human beings that makes mistakes. I hope you understand what I mean. Your book is going to be excellent. Not because you made it perfect, but because you have put your heart into it. Thank you so much for your kind and inspiring words, Patricia. I am learning to deal with the fact that I make mistakes and it is okay. I need to learn to just do my best and let the rest go. It is very nice meeting you. You're publishing a book. That's more than most people will ever do. Be proud of it, imperfections and all. Thanks for co-hosting today. Sending a book out into the world is always nerve-wracking. Take a deep breath and know that it will be fine. Murees, you don't realise how AMAZING you are! Congrats once again on your upcoming publication. Thank you for the inspirational post and for co-hosting the IWSG today! Murees, I understand that insecurity. We're like surrogate mothers sending our little book babies out into the world. Every time, I get that panic feeling too. Nice to meet you! It is nice to meet you too! Thank you so much for your kind words. It helped. Thank you, Hilary. It is rather nice getting out of my comfort zone. I've met so many great people. You are always so kind. Something I definitely need to keep telling myself. And I love the color of your blog. :) Thanks for co-hosting! Thank you. You are welcome. It was very nice meeting you. Alex is right. And it sounds like you're going about it the right way. A friend told me once, "You doubt because you care, and that can only lead to great things." That quote is pined above my desk now. You are welcome. Thank you for sharing this great quote with me. It is very comforting and inspiring. So great that you fought through your fears and went ahead with the writing. Concentrate on the accomplishment and not the fear. Thank you for your wise words, Susan. I will definitely do that:) I need to learn to enjoy my accomplishments. Thanks for hosting, Murees. YOU ROCK! The pleasure is definitely mine, Christine. I will definitely push through and enjoy it as much as possible. Wishing you the best. a bow. You deserve it. Thank you so much, Manzanita. You are a wonderful and kind woman. Wow, that is an exciting announcement. And I'm sure you will not fail as a writer. Just getting your book published is a huge accomplishment. It's hard not to worry, and yeah, perfection is ultimately not possible, but it's important to celebrate success sometimes. It helps keep you able to strive to get better, which is all we can really do in the end. Good luck! Thank you so much. Your words are very comforting. It is so nice to meet you. I felt exactly this way before my first book came out! And I'm feeling exactly this way as I wait for my second book to come out...I guess at some point you just have to take a deep breath and enjoy the ride. You made it! Congratulations! Thank you! I will definitely try your advice. I hope your second release will go well. Getting your first book out is amazing! Congratulations and thanks for co-hosting the IWSG this month. Thank you so much. It is definitely my pleasure to co-host. Thank you for visiting. Can't wait for your first book!!! How exciting and nerve-wracking. Murees, everything you wrote is perfectly normal, believe me. No one is perfect, even books being released by the big 5 have typos. It's easy for me to say don't worry because I'm the same way when release comes and goes. Wishing you much success! Thank you, Cathrina! Your words really help. I'm sure the nerves will settle soon. I'm getting to terms with the fact that I'm only human and that my book will never be absolutely perfect. I'm one of those people that can always find something to change. Thank you for your encouragement. It's all completely normal and you're handling it just fine. And don't wait around after you publish. Smile, toast yourself, and get right back to work! Thanks for co-hosting, Murees. I hear your fears. In fact, I recognize them as mine. Thank God we have each other to rely on for strength. Here at IWSG, we've got your back! It is my pleasure. It is going to be great fun. Thank you for stopping by. Fear can be crippling and so many give in to the fear. What I am happy to have read is that, despite your fear, you pushed on. It also sounds like you are a perfectionist which is a blessing and a curse. I see it in my hubby and I saw it in my mom. I don't have that:) This perfectionism actually can make one from telling a nice story or being a nice craftsperson to being a true artist. Let the faith in yourself triumph over the fear. The worst is never doing something and then regretting not doing it. Thank you so much for your encouraging words, Birgit. You are very kind. Thank you for the visit. Thanks for co-hosting. Great post and encouragement. My favorite part of the post was the end where you said, "If any of you think you can't write a book, or that you can't make your writing dreams come true, you can. If I can write a book and get it publish ready, so can anyone. All you have to do is believe in yourself and be determined to follow through." Determination and Follow Through, no matter how long it takes, yup, yup, lol. Bravo, you're spot on with your writing, and publishing,. This sounds like incredible fun. Congrats on your book! I imagine it's so stressful, but chill... you published something! That's awesome! You are very welcome. I'm happy that I could help. I mean it. You have to believe in yourself first. You can do it! What a great idea for short story writers. I'm a tad green about this one. Thank you so much for stopping by and commenting. It's definitely exciting. So 1, relax. And 2, realize there will be people who hate your book. It's inevitable. Also realize you didn't write it for them. There will be people who love it, and they're your audience. Finding them is the difficult part and the pain that any new author must suffer through. Thank you, Crystal. Luckily I'm used to suffering for my writing:) I'm definitely more relaxed now. My book will be out there soon and I have decided to let the chips fall where they may. Congrats and publishing your book. So many let the fear and nerves take over. Thanks for co-hosting IWSG this month and good luck with your release! Thank you so much! You are very welcome. hmmmm...I love a challenge. Time to put on the thinking cap. Thank you, Tyrean. You are always so kind and supportive. I appreciate it. Congrats on your book. I am excited for you and honored to be sharing your successful book release on my blog. It's a wonderful thing to be writing your ISWG post about being nervous about your first book. It shows how far you've come and how much you've accomplished. I know that you can't help the nerves, it's all part of being human. Your book is going to do great. You were one of my very first blogger friends and I feel so much admiration, inspiration and encouragement from your success. Thank you, Melissa. You are amazing and kind. It's nice to know that I inspired someone:) One of these days I'll be helping you promote your first book;) Thank you again. Great post. I can relate. New things scare me too. Most of the time, they turn out to be not as scary as I feared. Congratulations on your forthcoming book. You've succeeded. Enjoy the next steps, telling the world about your story. Thanks for co-hosting today and for visiting my blog. Hi, Murees. Thanks for co-hosting and thanks for commenting on my post. One of the things I learned when I was a Girl Scout leader (and that I tried to help girls learn) was that it's okay to make mistakes (as long as we learn from them) and it's okay to fail. But when working with others, we can do so much more than we think we can. Look at this wonderful group that lifts us up when we're down (or scared) and rejoices with our successes. Congrats on your new book! Thank you so much for your wonderful words. It is definitely my pleasure:) This group is really fantastic. First book baby is quite the nail biting experience, but it will be okay. Whatever is not right can be fixed. I call myself an imperfect perfectionist. A contradiction in terms, but so true. Congrats on your upcoming book! What a great job you've done co-hosting, and it has given me a chance to meet you. The first book is always so exciting and terrifying! What a combination of emotions, heh? Good luck and congratulations. Thank you! It is definitely a mix of emotions, but it is worth it. Congratulations on your soon to be published book! Enjoy every minute of it because the second book causes even more anxiety! Thank you for hosting this month. Thanks for co-hosting. And congratulations on your soon to be released book. One thing to keep in mind is that everyone has different tastes, so some will genuinely love your book while others may not. It is not a reflection of you or the quality of your work or the book. It's still hard to put it out there so good for you. You are a hero! Thank you so much, Eliza. You are awesome. I feel much better now. I second what Alex said - you're publishing a book and how many people can say that? I can totally relate to your fears as I am the same way but I try to remind myself of that too. Good luck with the release!! Thank you! It is definitely one of the biggest accomplishments of my life. I am still on cloud nine. Hi, Congrats on your new book, you're an inspiration and a reminder to keep at it! You're right. There is no such thing as perfection--especially since every reader will have their own definition of perfection. All you can do is your best and then let your story out into the world. Thanks for so-hosting this month's IWSG. Thank you so much for your kind and inspiring words. Co-hosting was definitely my pleasure. You are most welcome. Thank you for stopping by. I'm not good with change or new things either. Break a pen on the book! If you want help with spreading the word about it, email me. Thank you so much. Change definitely scares me. Thanks for hosting this month! I share your insecurities about wanting everything perfect, which I know is impossible, but I too worry about failure. Sounds like you're over the hump though and have a book about ready to break loose. Congrats! Thank you. I am sure my release will go well. Thank you for your kind words. Oh dear, Marie, I thought I gave up perfectionism until I began writing. It breeds perfection I guess. But,if there is a typo or misspelling, the world will not come to an end. You'll be fine. Thanks for co hosting. Congrats on your upcoming release. What JQ says is true, and if you do find a typo after the fact, you can always correct it. Oh, I know. That mean little voice in the back of our heads is always chattering away. We should definitely silence it more often. Wishing you the best. The what ifs can truly drive us batty. Great contest idea! Thanks for co-hosting this month! You are most welcome. It is going to be great fun. Enjoy! What-ifs in storytelling can be gold, but what-ifs in life and career can be fuel for fire. We all have to work through our what-ifs to overcome our fears and write the stories only we can. No one else can write your story, my story, or their story because it's within us. Thank you for co-hosting this month and sharing a bit of your fears and even a bit of encouragement. Thank you for co-hosting! How people would feel about your book is a fear that will probably never go away. But at least you did publish a book, and that's more than what most people can do. Like you said, it takes believing in yourself that you can. And perseverance. Thank you for your kind words. It helped. I am surprised we are all not on prozac with all the nervousness and anxiety writing creates. Keep on hanging in there. Well, I'm definitely on medication, maybe not prozac:) Thank you for stopping by. It is great co-hosting with you. Exciting and terrifying! I've never found a job so nerve wracking as writing. Definitely. One would think we would be used to is by now, right? Our nerves tell us that we really care about something. Nervousness and excitement are relatives. Keep telling yourself, "I can do brave things." Good for you. You are an inspiration! Thanks for being a co-host this month. Someone once advised me to shift my concept of nervousness and anxiety to see it simply feeling happily excited. It works, most of the time. In any case, these emotions keep us sharp. Welcome the experience, but be mindful of burn out. Take breaks, engage your inner child once in a while. Blessings. Thank you so much. That is great advice. I think I'm right on time to get in touch with my inner child. Awesome encouragement this month! I think George McFly has become my unofficial mascot. At first he is all afraid to do anything. What if no one likes what he writes? What if someone says he has no talent? He's not sure he can handle that kind of rejection. But my the movie end, he's telling people they can accomplish anything they put their mind to. What you said reminded me of that. We have to believe in ourselves, and stop being so fearful of the 'what ifs'. As for editing. That's another of my biggest fears. No matter how often I edit something. I later go over it and see another error, typo, redundant dialogue or something new that doesn't make sense. It's a big fear of mine. I need to get over it. I know you can too! Thanks for co-hosting this month! I know those feelings all too well, but I pushed myself past them and didn't let them stop me. Since publishing my book in February, I've done things so far out of my comfort zone. I still don't believe I did them. As you said, you have to believe in yourself. My two mottoes — "All things are possible if you believe," and Nike's "Just do it." Good luck with your book! Those are two awesome mottoes. Thank you so much for your kind and encouraging words. I am believing more and more each day. I still can't believe I'm going to publish my first book. Thank you so much for being a co-host this month! Congratulations on your up coming book. I think one of the most important things is to enjoy the ride. Yes, I'm sure things will be crazy hectic, but this doesn't happen for everyone...enjoy every moment! Thank you. I am starting to enjoy it all. Mostly, I am just very grateful for being able to publish. Thank you for the visit. I can do writing...it's the "being around people" part of it that gets to me. I don't know if I can get past that fear...especially if it involves getting up in front of a room full of people to talk!!! Unless it's going to make a big difference in my career, I just would rather hide, if that makes sense! But we need to push past that fear and try to conquer it. That's part of growing...it's just scary. I agree, it's super scary. Also, I fear people too. They are so unpredictable. Thank you so much for your encouragement. This is a great contest. I've started working on my entry. That is awesome. I know your entry will be great. woot! a cool contest!! i'm in! and as i get older, i accept alot more things i cant control. i hate the saying, "it is what it is" - but that's the way it is! we do what we can and deal with what we cant. thanks for the post! and contest! Thank you. You are awesome and very wise. I agree:) Good-luck with your entry. I think everyone is super nervous about their first book releasing. It's scary to think of all the people that will read it and judge it. But I promise it gets easier. And if there's a typo or two, no one's going to put you in grammar jail. You do the very best you can, then you let it go and work on your next project. Have a great weekend! Thank you for the visit. You can absolutely write a book. Ignore those nasty voices telling you you can't. Prove them wrong. Wishing you the best.